I went to see The Crimes of Grindelwald on Saturday evening. I'm not going to review the movie here, except to say that I enjoyed it enough that it inspired me to want to play my favourite Harry Potter board game on the Sunday. 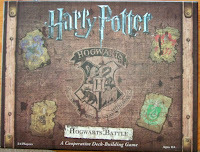 That is the Harry Potter Hogwarts Battle game, which you can see in the photos on this post. The game has been out for a couple of years, but is now much easier to buy than it used to be. I've even seen copies in Waterstones. Despite it having the word "battle" in the title, it is a deckbuilder card game, not a war game with miniatures fighting on a map of the school for witches and wizards. Every player starts with a small, standard deck of cards representing easy spells, but each turn gets the chance to acquire other spells, items or allies to help defeat Voldemort and his villainous minions - also represented by cards. Other cards show a series of iconic locations. The game is completely co-operative. Players take on the roles of Hogwarts students Harry, Ron, Hermione or Neville and must work together to prevent the locations being taken over by the forces of evil. You have overcome all the minor villains then finally defeat He Who Must Not Be Named before Voldemort gains control of the wizarding world. One of the things I like is that the game has several levels of play - from pretty easy up to quite difficult. It starts basic, but new cards and rules can be added when the players feel ready to take on new challenges as the pupils go up through each school year. This is a good representation of the books and films, but also a nice way to learn the game. I've played a few Harry Potter-themed games over the years - including Harry Potter and the Sorcerer's Stone Mystery at Hogwarts Game, which is a bit like Cluedo, and a couple of the Harry Potter trivia games - but the Hogwarts Battle game is my favourite of the ones I've tried. 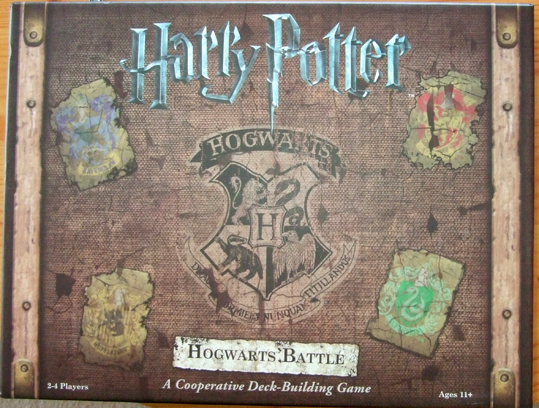 You can view the Harry Potter Hogwarts Battle boardgame on Amazon.